When Father Serra arrived at Monterey in 1770, he was met by the people of the Rumsen villages of Achasta. The news of the arrival of those foreigners traveled fast through the five Rumsen villages. It wasn't long before "Chanjay", the Headman from the Rumsen villages of Echilat, learned of their arrival. 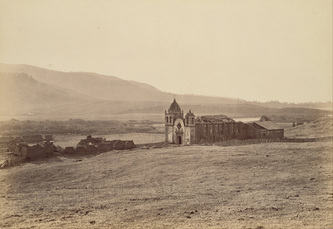 After gathering much knowledge and offering prayers to the creator, the sixty-year-old Chanjay convinced tribal Chiefs from the villages of Achasta, Tucutnut, Soccorronda, Echilat and Ichxenta to send tribal members to assist Father Serra in building Mission San Carlos and planting crops. When the Mission came into hard times and could not provides for its people, it was Chanjay who provided the Mission missionaries with the knowledge of what could be harvested from the wild for food. Chief Chanjay's role as a Rumsen Headman was to pass on the culture by his teachings, stories, songs, and dances, organizing gatherings and by conducting ceremonies. He led his tribal members who were mostly young men to the best hunting ground and coastal fishing areas. Chanjay sanctioned marriages and oversaw disputes among tribal members and other Rumsen villages. The villages of Echilat were in constant conflict with Esselens over crops and hunting grounds. Chanjay was always able to out-maneuver the Esselens. As a consequence of this constant conflict with the Esselens, most of the inhabitants of Echilat were always very young most were under 25 twenty-five years of age. 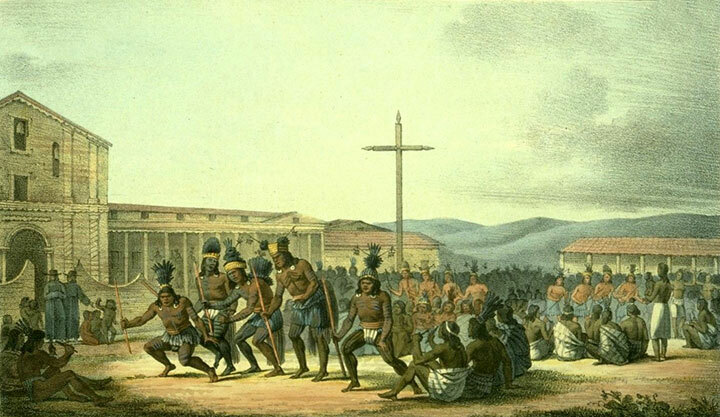 By 1783, 90 tribal members from Chanjay's village entered Mission San Carlos to become members of that Mission. Little did they know what lay in story for them, as upon their joining they were enslaved for life. In April of 1775 Chanjay and his wife, the last adult couples to leave the villages of Echilat, were baptized and given the Christian names of Simon Francisco and Magdalena Francisco. Father Serra as Father-Presidente was responsible for the placing of the entire Indian population in a servile position. If any Indian left the Mission and returned to his or her village, Serra would order the Spanish soldiers to bring them back to the Mission. Once returned, the Indians were beaten and placed in confinement for a period of time. Chanjay objected to the punishment of his peoples many times. He would plead with Serra to allow his people and other Indians from the Rumsen tribes to return to their villages. Serra would allow Chanjay to conduct ceremonies and gatherings with the Indians under the watchful eyes of the missionaries. When Fr. Tomas Estenaga was the administrator at Mission Dolores in San Francisco, there was an illness that affected the women more then the men. According to the statistics, about half the women died. The young men were not able to find eligible women suitable for marriage. This caused a problem with the older couples, as the women would take off with the younger men. To solve this problem, Father Tomas arranged for the young men to travel to other places where they might be needed as workers, and also to find a wife. In the summer of 1834 Tiburcio, son of Sumu Chief of the Chiefs from the San Francisco Area, left for Monterey. 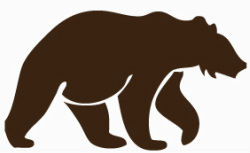 At this time Monterey was the Capital of Alta California. Tiburcio Arrived at Monterey as part of group of workers sent to Monterey by Fr. Tomes, the priest at Mission Dolores, to work on projects at the capital. 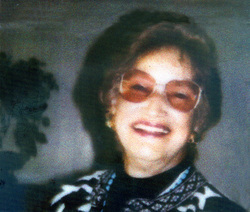 Upon arriving at Monterey, Tiburcio met Maria Del Rosario; "Rosadio", great-granddaughter of Simon Francisco, "Chief Chanjay". They were married on April 27, 1834 in the Mission church of San Carlos. Being the son of Sumu, Tiburcio had a royal aura of authority about him. 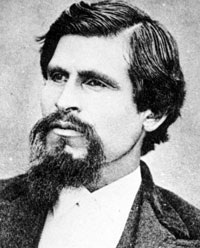 Shortly after their marriage Tiburcio called to the remaining members of Chanjay's people and convinced them to follow him to Mission Santa Cruz. 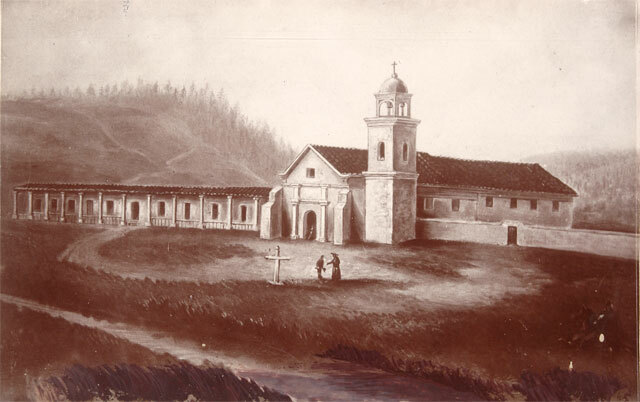 After arriving at Mission Santa Cruz, on August 28, 1835 Rosario gave birth to a baby girl, Maria Jocefa de la Roses. Jocefa was baptized at Mission Santa Cruz. By this time all the Missions had been secularized and the Rumsens were moving from place to place working as domestic farm hands and vaqueros. The tribal members worked for food and lodging as wages for their labor. 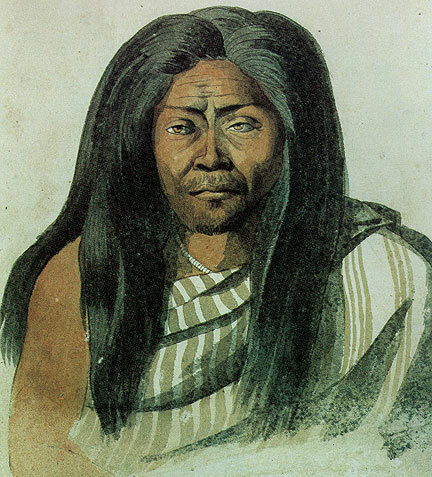 Upon the death of Chief Tiburcio in 1875, his daughter Jocefa Silva assumed the leadership and duties of Chief over the Costanoan Rumsen tribe that had originated from the village of Echilat. Silva was born in 1833 at Mission Santa Cruz. In 1876 Jocefa Silva summoned all the Costanoan Rumsen tribal members to a prayer meeting in a field near her home in Duarte, California. There they built a sweat lodge and her eldest son Jose Santos led the sweat. They also built a huge fire and participated in a talking circle around the fire before entering the sweat lodge. There she repeated the need to engage in tribal ceremony. After the community sweats they had a dinner where everyone brought something to eat. When they were done eating, everyone danced around the fire while some of them sang and kept rhythm with clapper sticks and rattles. So it was that in the summer of 1876 Jocefa Silva led the first open prayer dance that was attended by Indians as far away as San Diego. 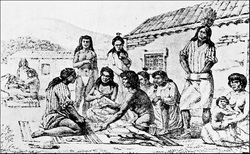 Since coming to Southern California our people had intermarried with other Indians in the area - Cahuillas, Serranos, Chumash, Gabrielnos, Yaquis and Dieguenos. In 1883 Jocefa Silva met Helen Hunt Jackson, who was sent out west by the Bureau of Indian Affairs to record the history and investigate the needs of the California Indians that included the Mission Indians. In Mrs. Jackson's report entitled "Report on the Condition and Needs of the Mission Indians" she wrote "In conclusion, we would make the suggestion that there are several small bands of Mission Indians north of the boundaries of the so-called Mission Indians agency, for whom it would seem to be the duty of the Government to care as well as for those already enumerated. 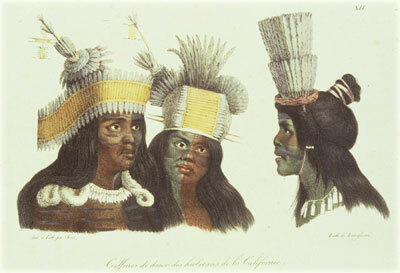 One of these is the San Carlos Indians, living on lands, which were given to them before the secularization act in 1834. These lands are close to the boundaries of Rancho San Francisquito of Monterey" (now the San Carlos Ranch). Helen Hunt Jackson obtained this information after spending time with Jocefa Silva, who had a vivid memory of what her father had said during his many hours of oral history of what had taken place at Mission San Carlos Borromeo and the lands around the mission. 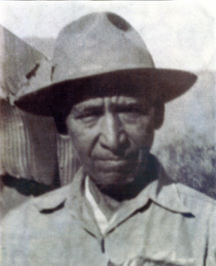 Enrique Rodriquez became the Headman of the Costanoan Rumsen Tribe upon the passing of Jocefa Silva in 1927. Enrique conducted a prayer vigil that lasted all night, with tribal members taking turns singing with clapper sticks and rattles for Jocefa Silva who had carried the leadership through the end of 19th Century into the 20th Century. Jocefa Silva refused to accept the conveniences of the modern world. Until her death she lived in the Native American way of life. She lived in a rustic wood shack with a dirt floor. In the house she had a large room where she conducted Rumsen tribal meetings. 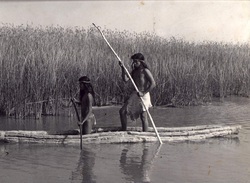 The first act upon being made Headman, Enrique was to conduct a census of all Costanoan Rumsen Carmel tribal members living in the Los Angeles, San Bernardino and Riverside counties. Many of the tribal members were working on the Lucky Baldwin Ranch, Fredrick Louis's Diamond Bar Ranch, Revel English's Sierra Vista Stock Farms (later became "The Old English Ranch") and Richard Guird's Chino Land and Water Company. These ranches had formerly been Spanish/Mexican land grants. Enrique Rodriquez had an old barn on his property in Duarte. There he would bring tribal members together where they would learn about their culture by making baskets, soap root brushes, rattles, clapper sticks, story telling, tribal History and participate in songs and dance. Upon the passing of a tribal member Enrique would summon all the members of the tribe to the barn where he would hold tribal memorial ceremonies. Sometimes during the summer months Enrique would call the tribe to get together and travel a long distance to celebrate some significant ceremonial gatherings. The tribe would go and travel pretty far, they would eat and sing and sleep there maybe three or four days. While the elders were having a meeting, children were not allowed to be there. After the ceremony the elders would get together, eat, tell stories, sing and dance and have a good time. When Enrique Rodriguez crossed over to the Spirit world, Irene became the new leader. Irene did not follow in Enrique's tradition of frequent culture workshops, gatherings and ceremonies. She did keep the Costanoan Rumsen tribe together by having meetings at Arcadia Park in Arcadia, California and kept everyone informed as to the research that she was doing on our tribe. She remembered stories that were passed down from Chanjay, Tiburcio, Jocefa and Enrique about the village in the mountains "Echilat", how they were constantly fighting with their neighbors the "Esselens" over the village site because of the natural supplies that the site provided such as fresh water to drink, deer, turkeys to hunt and eat, willow, redwoods to make homes and sedge to make baskets, and most important, black oak and valley oak, everybody's favorite acorns. Lopez would often gather everyone together and tell stories about the trips from the village to the beach during the summer to gather smelt, abalone, mussels and other sea foods, and how all the tribal members would get together and build sweat lodges and fires on the beach. There they would tell stories, sing and dance around the fire for several days and sometimes lasting weeks at a time. On one occasion, Lopez related a story that took place in 1928 when tribal members Abel and Felipe Silva went to Monterey. The tribe received word regarding some money that we had coming. They returned with this story about our inheritance. 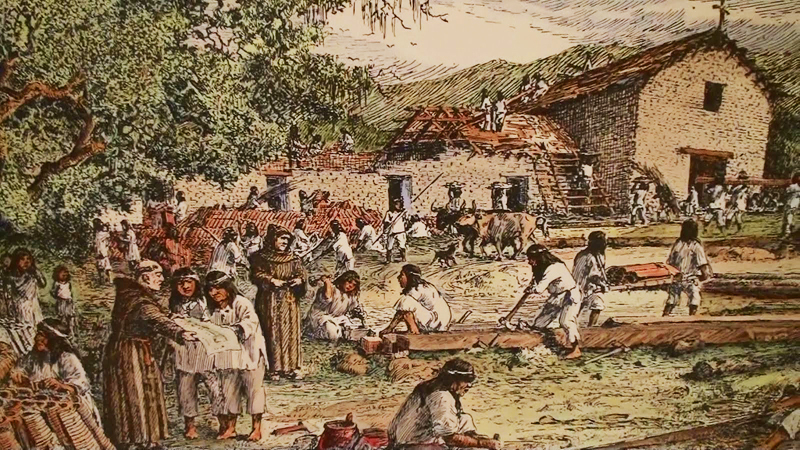 At the village site of Echilat they found that a hacienda had been built. They described it as a huge house with stairways and large chandeliers hanging from the ceilings and herds of deer and turkeys milling around. 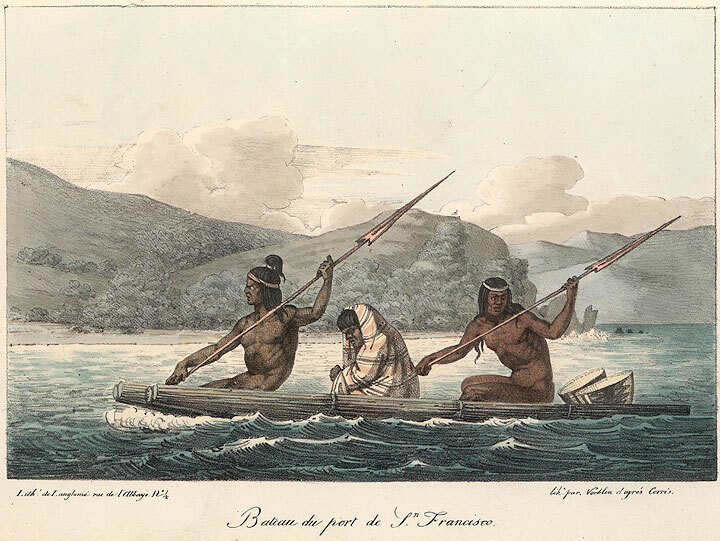 At these Lopez also spoke about the migration from San Carlos to Santa Cruz, where Jocefa was born, to Santa Clare, to the Indian village Alial near San Jose where they held the talking feather ceremonies. Then back to Santa Clare, Santa Cruz, San Juan Bautista, Soledad, San Antonio, San Miguel, San Luis Obispo, La Purisima, Santa Inez, Santa Barbara, Buena Venture, San Fernando and at last arriving at the Indian village near Mission San Gabriel. About the gold that Tiburcio would go to the mountains to get. Each time that he went, he got only as much as was needed to get along. Later on Irene went with Henry Rodriguez looking for the gold, but no one ever found it. Our stories still tell us that the gold is still there. Irene did a lot of research with the help of tribal members Delia and Johnny Casados. 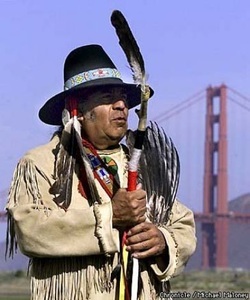 In 1985 Anthony Miranda assumed leadership over the Costanoan Rumsen Carmel Tribe. Irene Lopez resigned her duties as Headwoman due to health problems. Tribal members Johnny and Delia Casados, researchers for the tribe, left all the data they had collected over the past years with Miranda. On October 23, 1992 the Casados sent a letter to all tribal members informing them of a tribal meeting with Anthony Miranda at Arcadia Park in Arcadia, California. Tony Miranda attempted to assure the tribal council and membership that he bad been working to gain tribal acknowledgement from the Federal Government. Miranda stated that he had a filed a petition for acknowledgment on September 19, 1988 as The Costanoan Band of Carmel Mission Indians. Miranda had not identified the name that had been used since the Costanoan Rumsen Carmel Tribe arrived in Southern California in 1864. On November 14, 1992 at Arcadia Park, Miranda once again addressed the issue of Federal Recognition. He told the tribal membership that they needed to get certification from the BIA in Sacramento. At this meeting Tony Cerda was elected as chairman of the fund-raising committee. Cerda began an immediate fund-raising program, staging everything from cake walks to a yard sale at the El Rancho Grande, the Cerda family-owned restaurant in Chino California and also staged events at several of the homes of tribal members throughout the San Bernardino county area. The purpose of the fund-raising events staged by Tony Cerda was to provide Anthony Miranda with funds for food and lodging to be able to attend meetings in Monterey on behalf of the Costanoan Rumsen Carmel Indian Tribe. 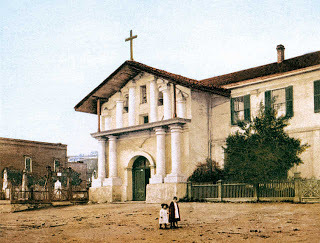 On January 4 and January 11, 1993 Miranda pleaded before the Monterey City Council to force Mission San Carlos Borromeo to obey state laws concerning building on Native American sacred lands. Since Tony Cerda has been Headman of the Costanoan Rumsen Carmel Tribe we have been very active in getting our History out. We regularly participate in and sponser native american events, gatherings and teachings both locally and abroad. Simply search through the pages of this site and you will see how much we have accomplished, what we have yet to accomplish and what the future holds for our people.